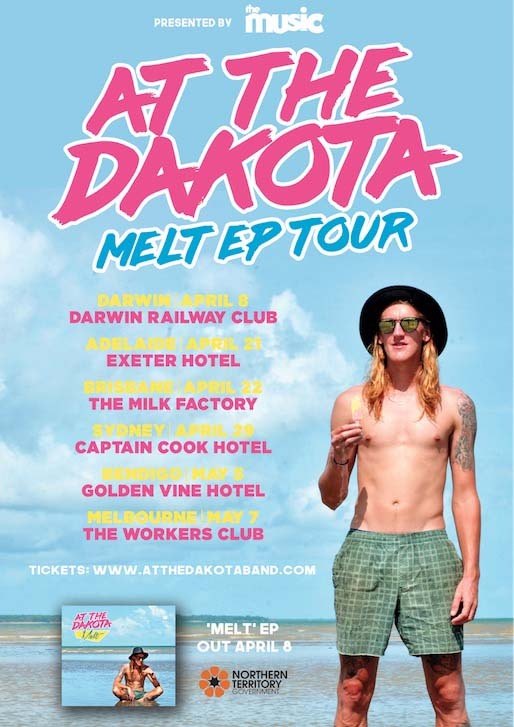 After releasing their latest indie-pop offering Arrow Holder in February, Northern Territory’s At the Dakota, announce a huge national tour to celebrate their second EP Melt including stops in Darwin, Adelaide, Brisbane, Sydney, Bendigo and Melbourne. Released on Friday 7th April Melt will feature singles Arrow Holder and Go My Way. It’s a tribute to fun times, hard times and times when you melt inside your own head. Filled with sing-alongs, wiggle inducing tunes and summer vibes - it’s a bit of tropical Darwin for your ears. Recorded and produced by award winning producer Broadwing in a Darwin rehearsal studio and Broadwing’s portable studio, the EP has raw energy, authentic enthusiasm and heart. Hailing from tropical Darwin, have established themselves as one of the most exciting bands to come out of the Northern Territory with their addictive pop sensibilities and hooky, quirky lyrics and melodies. At The Dakota’s sound is influenced by the warmth and optimistic attitude that epitomizes Northern Territory living. Their songs are unapologetically groovy, they’re catchy and energetic and their lyrics are refreshingly cryptic. The five-piece have supported The Rubens, The Bennies, Saskwatch and Ball Park Music, they won a People’s Choice Award in the NT Song of the Year and won the public vote to perform at the 2016 BASSINTHEGRASS Festival. Finalists in the National Live Music Awards in 2016, the best way to get a sense for this band from the top of Australia is to see them live. Tickets from At the Dakota.